Hey Folks. Been crazy and busy and crazy busy. I’m doing my best to get back into the swing of writing posts and I have a number of things to catch-up on. With so many breweries in the city it’s sometimes hard to keep up with everything that’s happening. So, if I’ve missed something in this update, please either let me know via email <beerwinnipeg@gmail.com> or post a comment about it. Torque Brewing has released this years edition of their Foundation Pale Ale. This year Torque has partnered with the Never Alone Foundation to raise funds in support of those affected by cancer. Torque will be donating $4 from every case of foundation to this worthy cause. The beer is out now, and It’s good. Torque also has two more beers to mention. One is new and one is a seasonal favorite. Czech Please Bohemian Pilsner is out now while their seasonal hefeweizen Magnetic North will be coming out soon. They’ve also got some fun beers at their taproom. Be sure to check their website and follow them on twitter for updates. Half Pints Queer Beer is available now around the city. This is a seasonal favorite. They also have their holy trinity beers coming out this month, so watch for those. Barn Hammer has made my life, and yours, a bit easier to know what sort of fun events they will be hosting/participating in. They’ve launched an events page to keep you up to date. Barn Hammer has also started canning beers and you can find those around town. They’ve also brought back their Old Friar Mead made with honey from Bee Project Apiaries. So be sure to check that out. All their current beers are listed here. Stone Angel is consistently brewing up a storm for their sweet taproom down Pembina Highway. They’ve brewed a collaborative beer with Brazen Hall that is worth giving a try. Also, If you’ve not been, I’d encourage you to go. They were brewing just the other day and will likely have some new beers for June. Follow them on twitter for all the updates (including their 60 glass series) and check out their current beer list here. Oxus has their beer available around town now. I’d encourage you to try it if you haven’t yet. This is the latest brewery to open its doors here in Winnipeg and I’m excited to see what else they come up with. Currently they have three beers. One Great City has some new beers since I last wrote. They’ve got a Kettle Sour and a Scotch Ale that are well worth trying out. They’ve also got a Black IPA that will be coming in the near future and often do Cask Nights. If you are looking for a place to watch the Jets beat Vegas, check them out and try these beers. Finally I wanted to talk about Kilter. They’ve started brewing some prototype beers at One Great City and I’d encourage you to head down and try them out. This is the good news. In really horrible news, they have lost their space. You can read about that here. What I want to say is that if you are a realtor/building owner/anyone that can help them out with a new space, please get in touch with them. It’s really heartbreaking for them and if the community can help, I hope they do. I am sure I’ve missed something, and if I have, please let me know. Also, if you have something you’d like me to highlight, please send it my way so I can do so. My most sincere apologies to all of you out there in Winnipeg Beer Land. I’ve had a crazy month and it’s still going to get crazier. Work, family, starting a Ph.D program, all things that require my attention and I’m doing my best to balance. I love writing this blog and really want to be doing my best here, but sometimes it’s going to take a backburner as I do it for fun. There have also been some other updates in the beer community but I’ll save those for Beer News this Friday. Torque has become a fun brewery here in Winnipeg. From their start they’ve focused on producing a variety of beer options and have always made sure to keep their taproom stocked with some new small batches for people to try out. I’m always excited to see what they’ve got on the menu and they do not disappoint. They recently announced a potential expansion as well, so that means more awesome beer! For this Czech style Pilsner, they went all out. Not only did they stick with the traditional ingredients, they spent a great deal of time and effort trying to get the water just right. They softened it up so that they could try and match the water that makes this style. Pilsners are one of the most popular beer styles in the word and originate in the City of Pilzen in 1295. While Pilsners are considered to be bottom-fermented beers now, they were actually top-fermented until about the mid-1840s. The taste and standards of this older styles varied widely and in many cases entire barrels of beer were dumped out. In 1839 the city of Pilsen founded a city owned brewery (now Pilsner Urquell) which was to brew beers and pioneer the Bavarian style. Brewers had already begun to brew using bottom-fermenting yeasts that were fermented and stored in colder temperatures to be drunk later. This is where the term lager comes from. Lagern is the German word for storing and comes from this process. Classic American Pilsners – Brewed with more corn and rice as well as native cluster hops along with the noble hops when available. All modern pilsners are very clear, very light beers that are pale to golden yellow. All of them have a distinct hop aroma and flavor. There are also Dutch and Belgian pilsners (not a separate style) which can be slightly sweeter. Appearance – Golden in colour with an effervescent head that dissipates quickly. Smell – Light malt notes, clean and bready, with light grassy hop notes. Taste – Light, refreshing, a crisp bite at the finish along with some subtle hop bitterness. It has a semi-sweet malt characteristic to it. Mouth Feel – Good carbonation with a coarse mouth feel and a nice lingering finish. Overall Thoughts – Overall it was a really nice Bohemian Pilsner. I think it hit the highlights for me and over was a nice offering. Do I like it? – Yes, I did enjoy this beer. I really like pilsners when it comes to the “lighter” beers. I think that they offer something interesting and flavourful. This one was certainly a very nice beer and I really enjoyed it. Just in time for this warm weather. I’ve got some more posts lined up and look forward to getting them up. Thanks for following along. A bit of a late post today, sorry about that. It’s been that kind of week. I am likely missing some things, so please forgive me. The International Women’s Collaborative Brewday beer was launched. This Rooibos infused witbier was brewed by an incredibly talented all-women team of brewers. “Witch Hunt” as it is called is available now and I suggest you get down and drink some. Barn Hammer has released a set of Rum Barrel Aged beers to enjoy. Check them out at the brewery. They’ve got Fur Trader, Theodore Augustus and Grandpa’s Sweater. Stone Angel continues to do some really fun stuff with their “60 Glasses” series. I suggest you follow them on twitter to be kept in the loop to what is coming up. They’ve also recently released a Radler called Onkel Georg. So get down there and try it out along with their other beers. Fort Garry Brewing has released a trio of seasonal beers. They’ve got a “Special Lite” American Ale, Tropical Hard Cider and Black Pearl Coffee Stout. The first two are available now, while the coffee stout launches officially tomorrow. 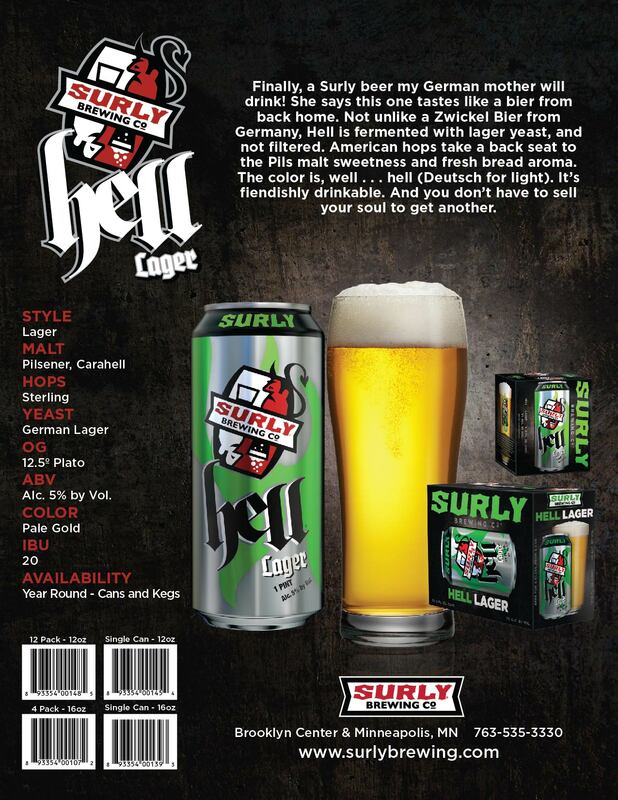 Finally this week, Surly is bringing in some new beers for us to enjoy. 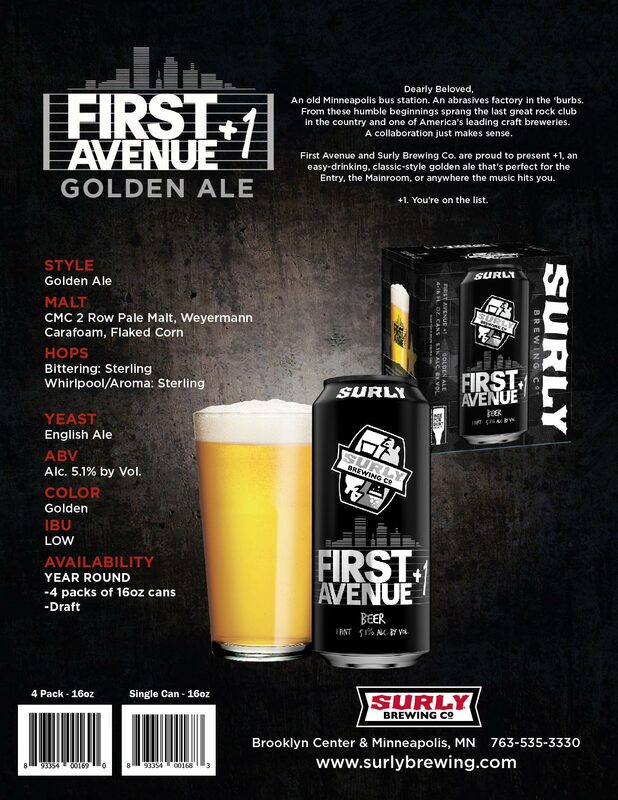 You can find Surly Hell and First Avenue +1 Golden Ale around town. 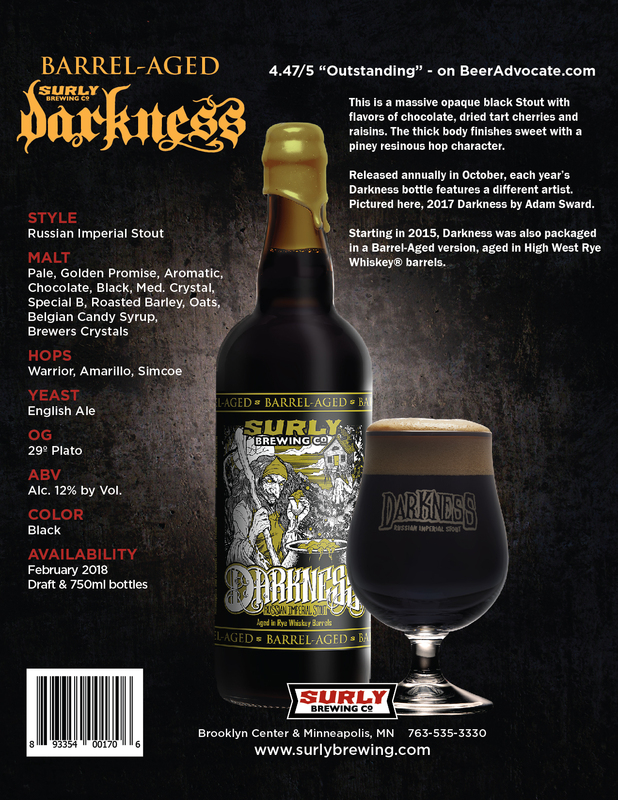 Soon to follow, a very small quantity of Barrel Aged 2017 Darkness (aww yeah). In June, along with some surprises for Flatlanders, we will see variety packs start to arrive. 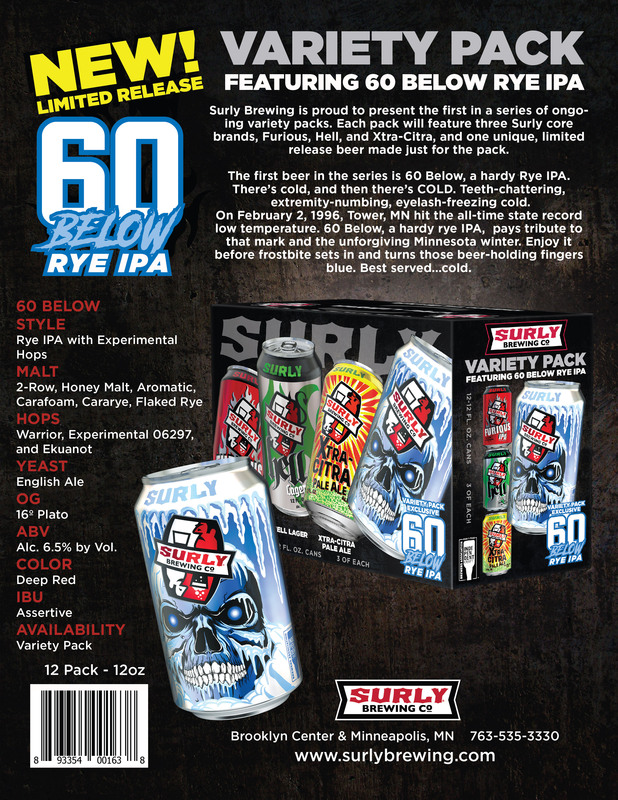 The first includes Hell, Furious, X-Citra and 60 Below Rye Pale Ale. Expect some write-ups on these as they start to arrive. I’m STILL planning to get down to visit Kilter and do a follow-up to my initial post on them. There are also some beers from Beau’s that I will be doing a write-up on in the near future. Support your favorite local breweries and definitely give them a try if you haven’t. I totally brewed that Barleywine. It’s done fermenting and is looking pretty good. I’ve not managed to get my hands on any Brett, but hopefully I will soon. I want to get this stuff inoculated so it has time to mature. But, you’re here to hear about what’s going on in the beer community, so let us get to it. Barn Hammer has also released a full-batch of their Strawbarian Milkshake IPA. I am super excited and can’t wait to get my hands on some today. It was released yesterday and you can either grab a pint in the taproom or take a bottle home with you. Stone Angel continues to do some really fun stuff with their “60 Glasses” series. I suggest you follow them on twitter to be kept in the loop to what is coming up. They’ve also recently released a Radler called Onkel Georg. So get down there and try it out. This one comes with a picture. Little Brown Jug has brewed a 4000L batch of a Belgian IPA that will be available as of today. You can for sure get it at the brewery itself, but also at Charleswood Beer Market, Quality Inn, Econolodge and the Tux Beer Market. I had a sample and really enjoyed it. I think you will too. At least you oughta give it a try. Oxus Brewing Company has released beer! This is an amazing thing. Oxus has been working so hard to get the brewery open. It’s a one-man-show for the most part and I’m really impressed with what he has been able to accomplish. The first two beers from Oxus are Juice of the Oats Oatmeal Stout and Transoxania India Pale Ale in 650 ml bottles. You can get them at Liquormarts and Beer Vendors around town (Quality Inn, Charleswood Beer Market and others). A third beer, Canadian Dream Blonde Ale is on at various beer vendors around town. I’ve had the IPA and I thought it was quite well done. Trans Canada is announced the first of its four core beers. The event was quite fun and the beer is a solid Amber Ale called Lamp Lighter. Torque Brewing continues to have fun stuff on at their taproom. They’ve got some new stuff coming out in the near future. For their full release calendar, remember to check this post here. Next up appears to be a Dopplebock, that sounds good. If you don’t have plans for this weekend, you should check out the Brandon Beer Festival. It’ll have a bunch of local breweries as well as others from outside of the province. It’s been growing as the years go on and it’s a fun event. Check out details here. While many may not be aware, we have a burgeoning hop grower community here in Manitoba. Give the growth in this industry, there are forming the Manitoba Hop Growers Association (MBHGA). This is exciting news as it means we will have more access, hopefully, to locally grown hop varietals. Great for home brewers and breweries alike. The beer scene here in Winnipeg is exploding. Oxus has officially released it’s first beers with more on the way. Kilter has announced their location at 80 Sherbrook Street adding even more awesomeness to that neighbourhood, Trans Canada announced it’s first core beer with an Amber Ale (still hoping that Brett Pale Ale will make it to the list of cores) and breweries keep pumping out fun beers I want to try like Strawbarian Milkshake IPA coming out today from Barn Hammer. I also want to take a quick opportunity to highlight a couple of upcoming events. First, Joel Carleton of Bee’s Knees is partnering with Winnipeg Tasting Tours for a Beer and Chocolate tasting. It sounds delicious, so if you like those things and are curious about them being paired together, consider checking it out. Now with that, to the main reason for this post. I’ve written about Torque on many occasions and feel that they are really pumping out some fun and unique beers. I wanted to take a chance to write about their Russian Imperial Stout. Torque has become a fun brewery here in Winnipeg. From their start they’ve focused on producing a variety of beer options and have always made sure to keep their taproom stocked with some new small batches for people to try out. This Russian Imperial Stout is a different recipe from last years’ Konstantine but still brings the same rich, velvety approach to a Russian imperial stout. It also pokes a bit of fun at our neighbours to the South. There are numerous styles of stouts ranging from Dry Stouts, to Porters, and Oyster stouts and my favorite Imperial Stouts. Russian Imperial Stouts are a style that I’ve really started to enjoy and appreciate. These beers age incredibly well and change over time. This style of beer was originally brewed in the 1800s by Thrale’s brewery in London England for export to the court of Catherine II of Russia. This same beer is brewed today now under the Courage brewery name and is called Courage Russian Imperial Stout (RIS). Ranging between 8%-12% alcohol with strong malt notes of coffee, caramel, chocolate and dark fruit (plums, prunes or raisins for example), it is a perfect beer for a winter night. Appearance – Pours a deep dark black with a nice tan head. Smell – Smell roast malt, cocoa and some subtle vanilla. Taste – There is a nice roasted malt flavour here as well as some of that cocoa and malt sweetness. The flavours are a bit disparate right now. The beer was good, but I think it will get better with some time. Mouth Feel – Good carbonation with a velvety mouth feel. Overall Thoughts – Overall it was a pretty good Russian imperial stout. I’m a fan of this style and I wasn’t disappointed. Do I like it? – Yes, I did enjoy this beer. As I said above, the flavours are all there but they don’t quite work with one another yet. I have more than one bottle and I am going to let the others sit a bit. I look forward to trying it with a bit of age. I am a bit late getting this out, so I am not sure if you’ll find this anywhere. They only produced a limited number of bottles. If you got some, good on ya. If you got more than one, I’d set one aside.